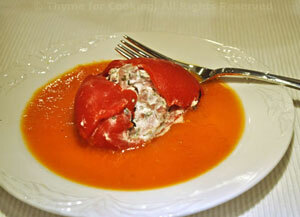 Pimientos Stuffed with Ham, Chevre, Thyme for Cooking easy first course. Stuff the pimientos with the chevre mixture and put in a baking dish just large enough to hold them. Heat oil in small sauce pan over medium heat. Add shallots and garlic and sauté until tender, about 5 minutes. Add the remaining ingredients and bring to a boil over medium heat. Reduce heat, cover and simmer for 5 minutes.